The Rutgers Organic Land Care Certificate Program provides education to landscapers and land care providers on organic practices for promoting healthy soil, enhancing biodiversity, and reducing polluted runoff from managed landscapes. 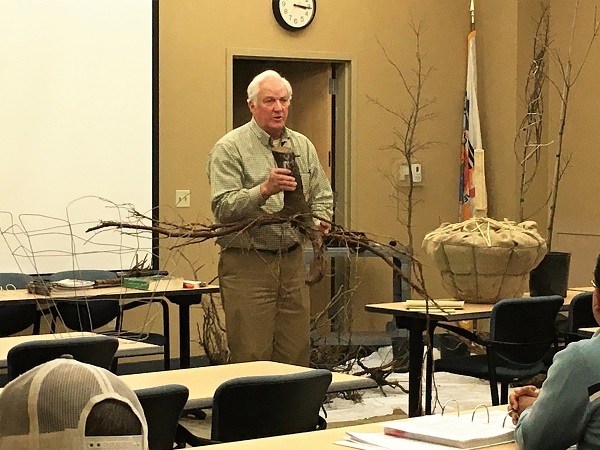 The core of the program is a 4-day annual course designed for professional landscapers, property managers, public works employees, groundskeepers, and landscape architects and Master Gardeners. More than 20 university and industry experts share their experience of how to successfully transition a landscape to organic management and add organic services to a business. On day 1 we will provide a basic overview of what organic land care is and is not. We'll learn about the history of the modern organic agriculture movement and how those practices can be extended to land care. We'll review the impacts of landscaping on water quality in NJ. The rest of the day will focus on soils including soil science fundamentals, proper soil management, the impact of soil quality on plant health, soil testing and interpretting results. The soil food web and practical methods for improving soil biology is included as well as methods for making and applying compost and compost tea. On day 2 we will cover best management practices for turf including establishment, renovation, fertilization, nutrient management, and cultural techniques that control or mitigate disease or insect damage will be explained. Ideas for using native plants will be provided as alternatives to a traditional lawn to create sustainable landscapes less dependent upon pesticides. We'll end the day with proper tree and shrub selection, genetics, nursery stock, and planting techniques to promote plant health and reduce mortality. Day 3 will cover risks associated with pesticides and how these pesticides interact with the environment. We'll identify common diseases and pests that effect ornamental trees and shrubs in New Jersey and provide an explanation of organic options for control. We'll end the day on a different note, focusing on how to design and install rain gardens on residential, corporate, and public landscapes. This last day is for frank discussion where those new to the field can learn from experienced practitioners. We focus on bringing all the information together for practical application. We'll review best practices to start transitioning to organic land care. We'll hear from experienced practitioners on how their business got started and diferent company approaches. We'll discuss business goals, assessing infrastructure, resources and profits, the importance of customer communication, marketing strategies, and how to adapt your business to be successful with organic land care. The certificate exam is administered on this last day. Passing an optional exam based on course content. Participants that pass the exam receive a certificate of completion and are listed in the Find A Landscaper section of this website as having completed the Rutgers Organic Land Care Certificate program requirements. The NJDEP Natural Turf and Landscape Management Certificate. Organic Principles: An Introduction to the History and Philosophy. Mark Keating, Wheel of Life Consulting. Understanding the Soil Beneath Your Feet: Physical, Chemical, Biological Aspects of Soil. Eileen Miller, Owner, Healthy Landscapes, Inc.
Rutgers University is an equal access/equal opportunity institution. If you have trouble accessing this page because of a disability, please contact the webmaster at 848-932-4202 or webmaster@njaes.rutgers.edu.